The past couple of months have seen the AV industry come down with a serious case of Dolby Atmos fever. For a while it felt like every other press release that turned up in my inbox was from an AVR manufacturer, shouting about the fact that its latest models are ready for the advanced audio format. Should I pay more attention to the AV small stuff? I have always been a fan of the phrase ‘don’t sweat the small stuff’. It was coined by the late Dr Richard Carlson in his best-selling book of the same name; a tome of wisdom that highlighted the dangers of getting hung up on the little details. Why I want flatpacked flatscreens! Earlier this week I was slumped in front of my TV in the evening, browsing the EPG, and found myself watching an episode of Gordon Ramsay's Kitchen Nightmares. As usual, the firey Scots chef was dealing with a hapless sap whose restaurant was losing more money in a week than most of us make in a year. And, as usual, one of the first things Gordon advised was to streamline the menu, knocking it down from its four-page anthology of culinary blandness to a simple selection of tasty goodies. A smart solution, I thought, knowing how annoying it can be to choose between meat and fish, let alone thirty variations of the two. And it's an idea that I humbly suggest could be employed by the AV industry. As noted previously, complexity is the Achilles' heel of home cinema. In an era of one-touch instant results, faffing about with the likes of THX Boundary Gain Compensation is not turning anyone on these days. We need switch-on-and-go simplicity; a clean, crisp movie-watching experience. In other words, home cinema needs to be more Zen. Lots of people watch movies at home on large screens, but how many go to the lengths of adding an AV amplifier, a full-size loudspeaker package and a subwoofer or two? Very few, because despite TV sound quality going backwards for over a decade, proper home cinema audio is just not on most people’s radar. Television is the new movie. Or rather: TV shows are the new media entertainment of choice when it comes to streaming video. Recent figures from survey-meister GfK show that content created for broadcast TV enjoys up to four times as many downloads as cinematic movies. In fact, GfK in the United States suggests that, across the subscription video-on-demand (SVOD) market, TV series account for 81 per cent of downloaded content against just 19 per cent for films. We may still be in the grip of economic gloom but I can see some light at the end of the consumer electronics market’s long dark tunnel, and that light is home cinema. During this recession, the electronics industry has fared even worse than other consumer goods sectors and has had more dips than a fondue party. The general public are simply not buying TVs and audio systems like they used to. In fact, throughout 2012, the UK public purchased half as many TVs as it did in 2006. I have yet another subwoofer-induced headache, and it's not from playing the opening sequence to The Expendables 2. Rather, it's from trying to get my noodle around a mind-bogglingly complex setup. You see, my period of single subwoofer purity has come to an end, with a second Velodyne DD18+ joining my system to capitalise on the new breed of 11.2-channel AV hardware. I have just spent 10 hours watching four movies back to back. It started with serious violent action from The Sweeney and the sci-fi remake Total Recall, then a re-run of Skyfall just to cement my opinion that it is my least favourite Bond film of all time, even though I still enjoyed it. The marathon concluded by having my noodle well and truly baked by Cloud Atlas. Has the HTPC finally come of age? 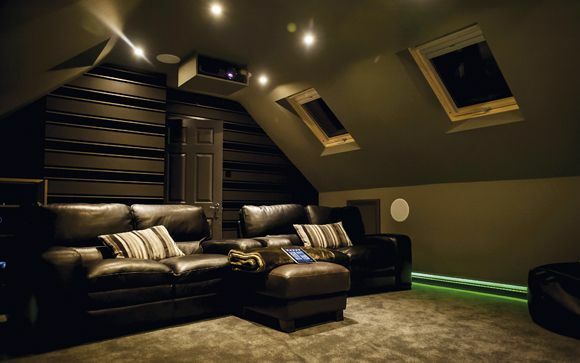 Always keen to maximise the potential of his home cinema setup, Richard Stevenson discovers that a 10-year-old idea still has a lot going for it. I recently visited a branch of Currys/PC World to make my seemingly monthly purchase of printer ink, and once I'd finished handing over a small fortune for a couple of teardrops of black liquid, I had a potter around the shop floor.